When Canadian bass-baritone Philippe Sly won the 2012 Concours musical international de Montréal, his innate musicality set him far above the field. It seemed natural to suppose that he would one day grace the cover of La Scena Musicale. Since then, his career has taken off. 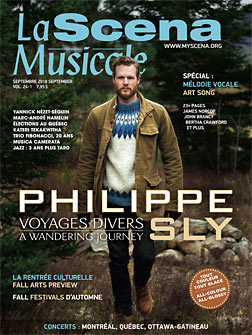 This fall is Sly’s time to shine, as he performs Schubert’s song cycle Winterreise (Winter’s Journey) twice in Montreal, first in September with pianist Michael McMahon for the Ladies’ Morning Musical Club in Pollack Hall and then in November with the klezmer band Le Chimera Project at Bourgie Hall. What is behind his fascination with Winterreise and art songs? We find out in Adrian Rodriguez’s interview. The art song genre seems to be in resurgence lately. In May the CMIM followed a global trend by dedicating a division to best art-song singer and collaborative pianist. We decided to take this opportunity to dedicate the September issue to the art song. Coordinating editor Richard Turp has submitted several interesting articles. CMIM’s art-song competition was an initiative of Toronto resident James Norcop. I met Norcop in July to discuss his motivation. All is not rosy for the art song. In May Norcop and the Canadian Art Song Foundation organized a symposium on the future of the art song recital, where 120 stakeholders met to share concerns and propose solutions. Linda Hutcheon provides a summary of the highlights of the discussion. Unfortunately, La Scena was not invited, as Norcop felt that frank discussion would only be achieved outside the prying eye of the media. Had I been there, I would have reiterated my view (see review in February 2017 issue which we republish on p. 67) that the art song genre would benefit from performances given in translation in the language of the audience. What is an art song? Norcop states simply that it is a poem set to music. As a singer myself, I can easily identify with this definition as most of my favourite art songs are settings of poems by greats like Goethe and Rückert. Norcop however draws a line between poems and lyrics to distinguish art songs from pop songs. Still, by this definition, Leonard Cohen’s “Hallelujah” will qualify as an art song. The emphasis in competitions like the CMIM and the work of the Canadian Art Song Foundation is on nurturing the next generation of art song recitalists. It seems to me that less effort has been given to encouraging the creation of the great art songs of the future. Thirteen years ago, I considered the Canadian Art Song Competition to celebrate the 10th anniversary of La Scena Musicale, but this plan was never implemented. I would like to bring back the idea in the form of the Next Great Art Song Competition planned for January 2020. The winning song will be determined by public vote. The next step is to submit the idea to the Aviva Community Fund. We invite all readers to support the idea with a vote of approval at avivacommunityfund.org or through mySCENA.org. We hope to garner enough funding to launch the official call for compositions in January 2019. The competition would be open to Canadian composers of all ages, so start thinking about your favourite poems and set them to music. Meanwhile, we are asking you our readers to vote for your favourite art songs in our Great Art Song Challenge at www.nextgreatartsong.com. The rest of this issue includes our Back to School and Fall Preview sections that guide readers to the coming arts season in classical music, jazz, theatre, dance and visual arts, including a look at New Opera Creations and what Canadian musicians are doing abroad. Our Fall Festival Guide rounds up our look ahead. Since September 2016, we have migrated our website to a new platform at mySCENA.org. Thanks to our web interns, we are working on developing new tools to help artists and organizations engage with the public. At present organizations can submit their events to our online calendar and also post press releases to our newswire service. It’s no secret that the media landscape is changing owing to the Internet. Advertising budgets are shifting. This impacts negatively our advertising receipts, which have traditionally accounted for 80% of La Scena’s revenues. We hope that our efforts to present more quality content will win your support in the form of a subscription or donation. If you subscribe, you receive each issue by mail (we also have an option for weekend Montreal home delivery) with supplementary translations in your preferred language. Furthermore, every two-year subscription comes with a free commercial CD. Any form of contribution is greatly appreciated and will go far in promoting artists here and abroad. See the sidebar for all of our fundraising opportunities. Have a great fall, full of music and the arts. Viva!